M1 and 1092 are the same blank. M1 is the 'EZ' number and 1092 is the 'Ilco' number. jeffmoss26 wrote: M1 and 1092 are the same blank. M1 is the 'EZ' number and 1092 is the 'Ilco' number. I get that,Jeff.I guess I'm not making myself clear.Other than just plain 'ol experience,can you look up a particular lock to find the blank you need for impressioning? 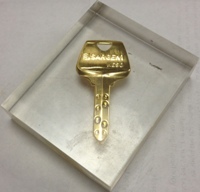 Ok,say someone gave you a lock you had never heard of before and asked you to make a working key.How would you go about finding a blank that fit? If you download the catalogs I gave you the link to, each is seperated by lock manufacture. So just open up the catalog that you need and scroll down to the type of lock and see all their keyways and get the number for it. Assuming there is a manufacturer on the lock, I would go to that section in the book and start finding a keyway that looked correct. If it's not marked, I would start with the 'A' names til I found something that looked right! DennisK wrote: Ok I get that,and that is exactly what I would have done had I had a key.The question I am asking is,how can you look up a blank if you only have a lock (no Key) that is unfamiliar to you? Generally you would look up the lock on the manufacturer's website. A lot of locks can have different keyways but it will give you list to start with. Another thing that will help your search is if you know how many pins your lock is. Lots of key blanks come in a variety of different lenghts. I appreciate the help,but that second link only comes up as html,or code or whatever that stuff is.I'm using Safari for a browser. Aside from documentation from the manufacturer, I imagine figuring out which key blank to use requires trial an error or going through the options. HerrMannelig wrote: Aside from documentation from the manufacturer, I imagine figuring out which key blank to use requires trial an error or going through the options. True,but I would have to take the lock to the hardware store,which would be ok I guess. How can I post a picture from my phone? Re: How to post pictures? Revinous wrote: How can I post a picture from my phone? You'll need a photo sharing app like imgur or photobucket. Upload your photo there then copy the url address suppliedin one of the windows. Paste that code into the replybox. There's a thread on here that explains it better. I'll see if I can find it.